My Braces Are Coming Off! I'm so excited, I just got back from an orthodontic appointment and I'm told that my braces can come off on the 15th of December. Yay! I've been wearing braces since January 2008, it has been just under two years since I got them on. In the beginning they used to hurt so much everytime I got an adjustment and I wouldn't be able to eat for days, but now when I get adjustments they don't bother me as much. It's kind of ironic, my sister is going to be getting braces on the 8th of December, and I'm getting mine off soon after! It would've been nice if we'd had them on at the same time. I'm really looking forward to seeing what I look like without braces. It seems like I've had them forever! I got braces to fix my overcrowding problem and I never had them in my teens. Now my teeth are straight and I'm looking forward to flossing without wires in the way! Here's a pic of me with braces, I usually don't smile in pics because of them but in this one you can see the wires. I wear clear on the top and regular metal on the bottom. 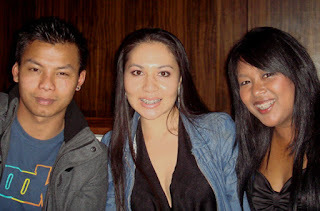 My friend Khem on the left also wears braces. Horray for not being the only adult in braces!